Vital Intervention and Directional Alternatives (VIDA) is a structured 16-week program for non-violent, at-risk youth between the ages of 11 and 17½. Through collaboration between the Los Angeles County Sheriff’s Department, community-based organizations, volunteers, schools and families, the program teaches youth the value of effective decision-making and taking responsibility for their futures. The program originated as the dream of a group of East Los Angeles Station deputy sheriffs who wanted to help troubled youths and their families. 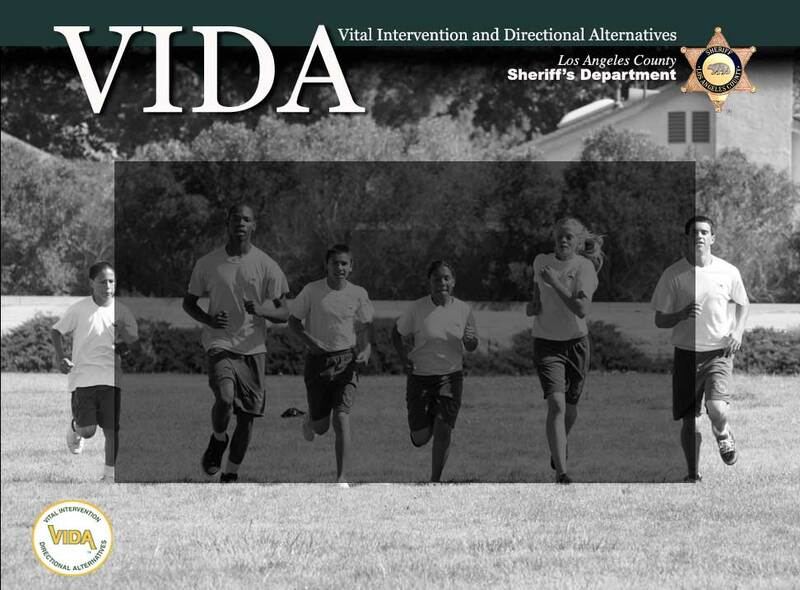 Since its inception in 1996 by patrolmen Drew Britness and Vince Romero, VIDA has grown into a comprehensive re-directional program with eight locations across Los Angeles County. The process begins with a referral from a community agency that has identified a delinquent youth. Referring agencies often include courts, law enforcement, the Department of Child and Family Services, Probation Department, school districts, parents and religious institutions. Upon referral, youths complete intake interviews with trained VIDA staff members. During the interview, the applicant’s risk level is assessed to determine if the youth meets the program’s targeted level of moderate to high risk of offending/reoffending. Following the interview and selection for the program, youths attend an orientation night with their families. Once the program begins, VIDA staff members conduct home and school visits during the week to monitor social behaviors, reduce truancy and improve academic performance. The mid-week re-directional component focuses on the student’s most pressing risk factors. Depending on the student, these range from family issues, educational issues, vocational skills and employment to anger issues, self-control skills, self-management skills, anti-social attitudes, substance abuse and anti-social peer contacts. Working to lower these factors involves addressing how the student interacts with the community and developing pro-social attitudes while reducing negative peer contacts. Students spend eight hours on Saturdays at the VIDA sites closest to their homes. The Saturday component focuses on students’ perceptions of themselves in relation to the community and authority figures. Staff members tackle topics such as personal health and hygiene, physical conditioning, individual and group dynamics, life responsibilities, substance abuse, negative peer groups, community stewardship and revitalization and gender-sensitive issues. In addition to the mid-week and Saturday components, students spend one night per week participating, along with their parents, in 2 hour group classes that target family issues. The goal of these sessions is to slowly rebuild damaged relationships and equip both the parent and child with problem-solving skills that increase positive communication and understanding. At the conclusion of the program, each participant receives a certificate of completion and is referred to other community-based programs to continue their individual goals and careers. It is the hope that VIDA students and their families will emerge with stronger bonds in place, as well as better judgment, integrity, tact, initiative, commitment, respect and a new take on life. After all, VIDA is life.